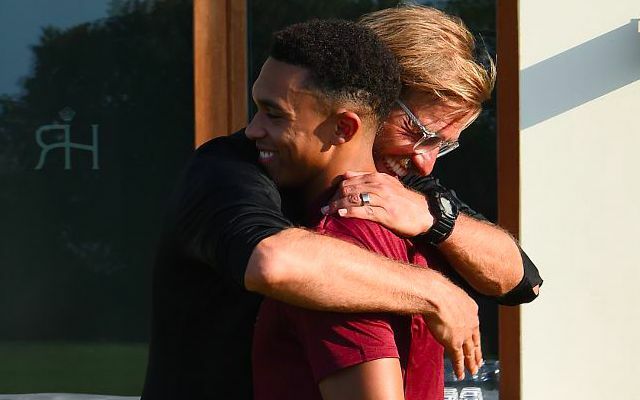 Jurgen Klopp says Trent Alexander-Arnold will continue to be monitored on a day-by-day basis amid his recovery from injury. The right-back was recently ruled out for at least two weeks after suffering a knee problem during the warm-up ahead of Liverpool’s 1-0 win away to Brighton. Fears of Alexander-Arnold spending up to a month on the sidelines have since been played down, with the defender having already made miraculous progress. A red card for make-shift right-back James Milner during Saturday’s 4-3 win over Crystal Palace has now turned the attention back towards the 20-year-old’s availability. Klopp’s men will now be afforded an extended break due to their early elimination from this season’s FA Cup, which is set to resume next weekend. This gives the German time to assess his options on the right side of defence ahead of a meeting with Leicester City at Anfield on January 30. Whilst Alexander-Arnold remains a doubt, the Reds could be boosted by the return of Joe Gomez following his six-week layoff with a fractured leg. The England international is scheduled to return to training next week and could be deployed in a right-back role he became familiar with last season. Liverpool will now fly to Dubai for a timely mid-season training camp.